Calling all chocolate addicts. Wish your chocolate milk didn’t have refined sugars, was dairy free, and that you could adjust the level of chocolate goodness ? Today I improvise on the basic recipe for cashew milk. There are so many possibilities. Enjoy plain, or with vanilla and dates, use as a base for a myriad of smoothies, or make a cashew cream for vegan sauces or soups. Here…we’re starting simple.. 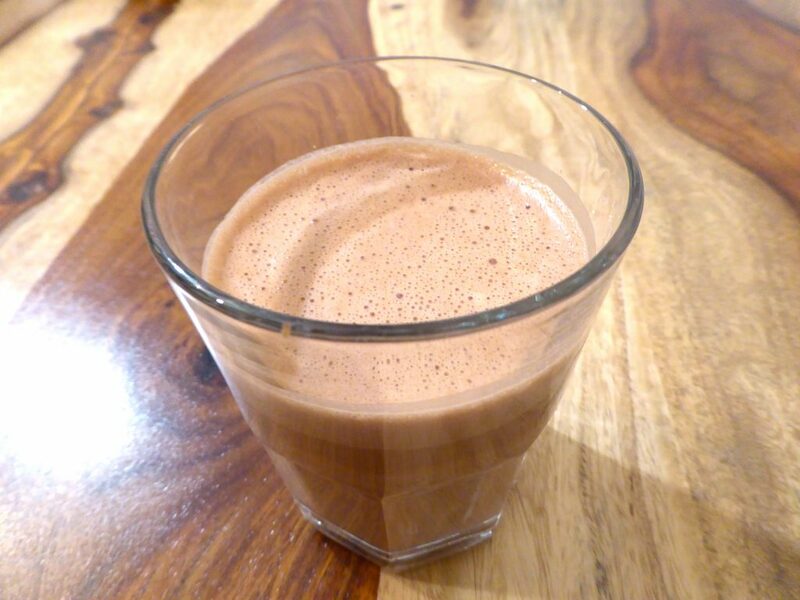 I transform it into delicious chocolate cashew milk. Cashew milk is in my opinion the easiest nut milk to make – no straining required, no messy nut milk bags or cheesecloths – and you soak the nuts for a lot less time than almond milk. Try making it yourself – it’s so easy and tastes so much more real than the cashew milk they sell at the store. A super high-speed motor blender like Vitamix or Blendtec. This is very important or the texture will not be smooth or as milky. Soak the raw cashews in at least double the amount of water for 4 hours or overnight. Cashews should be bulging, softer and enlarged. Discard water (or throw it in your garden maybe?) and put cashews in a high-speed blender (Vitamix or Blentec). Add 4 cups of filtered water to blender. Add 3 ½ to 4 tbsp raw cocoa powder (Adjust this amount to your taste. Begin with less and add full amount or more if you want it to be more chocolaty). Add ¼ cup grade A dark Canadian maple syrup. Blend on high speed using “juice” function on the Blendtec blender (about 45-60 seconds). Pour into a jug or container with a lid.